Lady Donaldson, née Frances Annesley Lonsdale, known as Frankie, was a daughter of playwright Frederick Lonsdale. In 1935, she married as her second husband John Donaldson, an academic turned farmer who later became British Minister for the Arts. 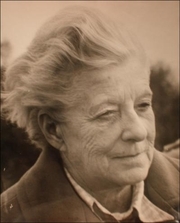 During World War II, she successfully ran their farm, and wrote Approach To Farming (1941), followed by Four Years' Harvest (1945), and Milk Without Tears (1955). She then turned to memoirs and biographies and produced Freddy (1957), about her father; The Marconi Scandal (1962); and Edward VIII (1974), which won the Wolfson History Prize that year and was the basis for a six-part television series "Edward and Mrs. Simpson." Other books included a dual biography of King George VI and Queen Elizabeth (1977), and lives of Evelyn Waugh (1967) and P.G. Wodehouse (1982). She wrote her autobiography in two volumes as Child of the Twenties (1959) and A Twentieth-Century Life (1992). She became Baroness Donaldson when her husband was created Baron Donaldson of Kingsbridge in 1967. Frances Donaldson is currently considered a "single author." If one or more works are by a distinct, homonymous authors, go ahead and split the author. Frances Donaldson is composed of 4 names. You can examine and separate out names.